Personality: Mab is very much...well...Mabbish. She is Fae, a race that is disgustingly overpowered and thus does not have to worry much about thethe daily troubles and grinds of the world. This often leaves Mab free to do anything she desires, which is often just hugging random things and playing games. Because of this, Mab appears very childish, ditzy, and even rather dimwitted. Not to mention she has a bad habit of taking phrases for their literal meaning rather than implied. However when certain events arise, Mab has at times switched into a less care-free personality which some whisper may in fact be her true self. 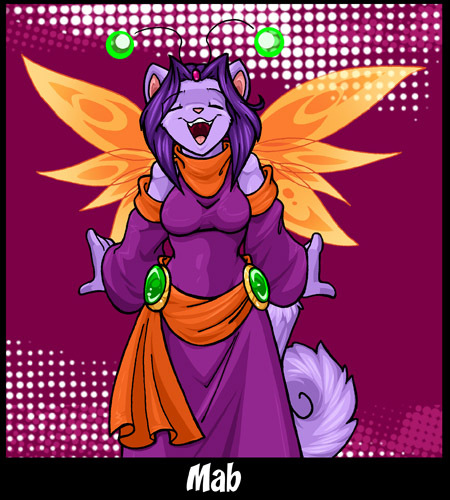 Mab is more than happy to go along with any of her friends plans with a smile and despite the worst odds seems to keep a cheerful optimism. It is very rare for Mab to actually have to exert herself as things always seem to fall into place when she's around. To some this makes her seem spoiled, to others it makes them glad she doesn't bother in the affairs of the world as other Fae in history have done. Mab's Quote: Everyday's a nice day with friends...or cookies. Or friends with cookies! That would be nice!